Jarrad Butler has made 10 good tackles so far this game. Chiefs sub Michael Allardice comes onto the field. Michael Leitch departs for Chiefs. Damian McKenzie makes no mistake with that conversion attempt. Fabulous play by Chiefs has led to Michael Leitch being able to wriggle through a gap. Spellbinding play by Damian McKenzie is finished off with a try. Silky skills by Chiefs ends with a try for Michael Leitch. James Tucker comes on for Chiefs. Michael Allardice leaves the field. Chiefs decide to make a substitution, with Tom Sanders getting some game time. Chiefs decide to make a substitution, with Mitchell Brown being replaced. Brumbies make a substitution with Ben Hyne coming on. Brumbies make a substitution with Thomas Staniforth coming off. Brumbies sub Ryan Lonergan comes onto the field. 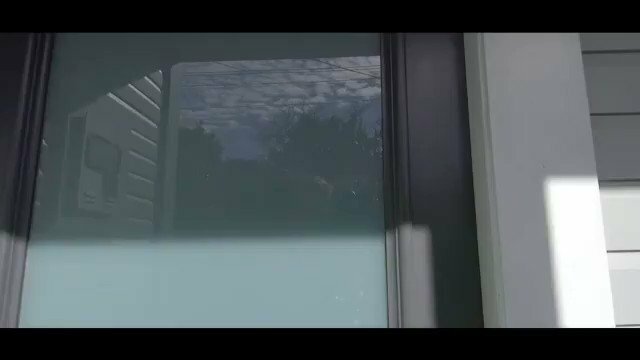 Tomas Cubelli departs for Brumbies. Shaun Stevenson comes on for Chiefs. Solomona Alaimalo leaves the field. Brumbies have won 60 rucks so far this game. Brumbies decide to make a substitution, with Josh Mann-Rea getting some game time. Brumbies decide to make a substitution, with Robbie Abel being replaced. Damian McKenzie does the business as his penalty goal attempt goes over. Brumbies make a substitution with Scott Sio coming on. Brumbies make a substitution with Nic Mayhew coming off. Brumbies sub Ben Alexander comes onto the field. Les Makin departs for Brumbies. Andrew Smith has made 10 good tackles so far this game. Thomas Cusack comes on for Brumbies. Lolo Fakaosilea leaves the field. A gap opened in the defence and Damian McKenzie took full advantage. Damian McKenzie has hooked the conversion to the left of the posts. The defensive line has been broken as Solomona Alaimalo goes through the gap. A wonderful passing move by Chiefs is finished off by Solomona Alaimalo. Tawera Kerr-Barlow has made 10 good tackles so far this game. Tomas Cubelli (Brumbies) is shown a yellow card. Wharenui Hawera makes no mistake with that penalty goal attempt. What a run here by Damian McKenzie as he gets over the gainline!. Damian McKenzie kicks the penalty. Brumbies have won 40 rucks so far this game. Solomona Alaimalo makes the break as the defence re-enacts the parting of the red sea. What a tackle there by James Dargaville as he saves a certain try!. Wharenui Hawera converts the try. That's a great try assist by Andrew Smith. A series of passes by Brumbies results in a try for Nigel Ah Wong. Fabulous play by Brumbies has led to Nigel Ah Wong being able to wriggle through a gap. Trouble here as Nathan Harris breaches the defence. Damian McKenzie has kicked a conversion. Solomona Alaimalo sets up the try. Great hands by Chiefs leads to a try for Damian McKenzie. This is dangerous for the defence as Solomona Alaimalo bursts through to advance the Chiefs attack. A gap opened in the defence and Henry Speight took full advantage. Damian McKenzie has kicked a penalty goal. The defensive line has been broken as James Lowe goes through the gap. 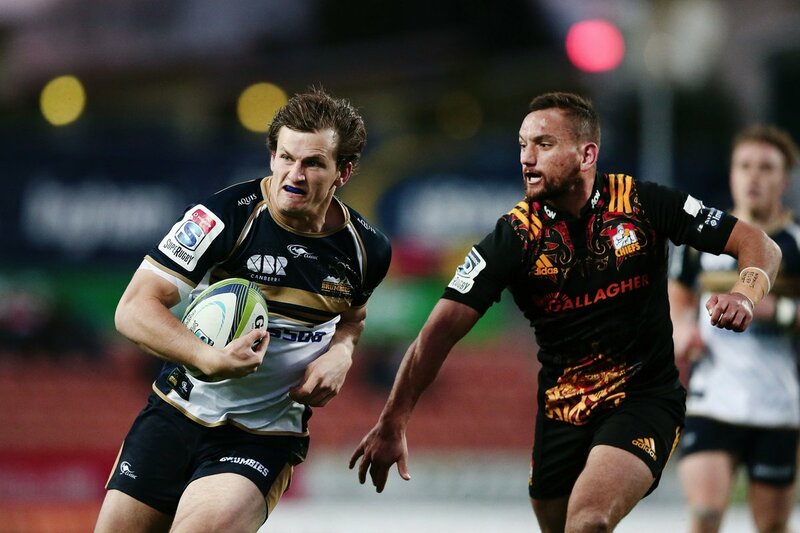 Brumbies have won 20 rucks so far this game.
.@BrumbiesRugby have fallen 28-10 to a determined Chiefs side in Hamilton. 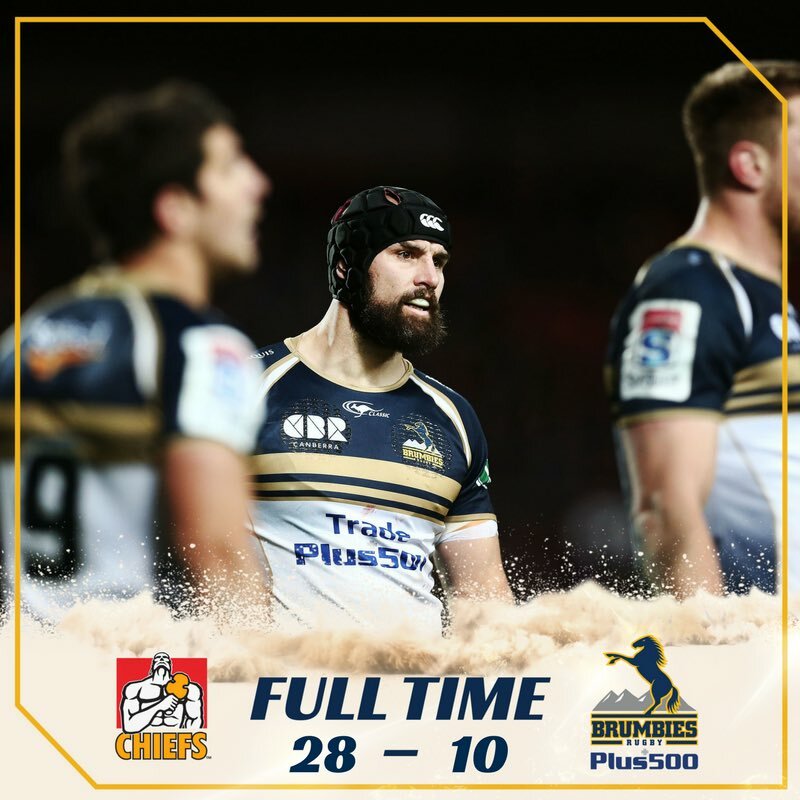 FULLTIME | @BrumbiesRugby fall to a strong Chiefs side in Hamilton, 28-10 the final score. 52' | Tomas Cubelli returns from the sin bin. 47' | PENALTY TO CHIEFS | Michael Allardice penalised for playing Henry Speight without the ball, Brumbies find touch on halfway. 41' | PENALTY TO CHIEFS | Tomas Cubelli sent to the bin for being deliberately offside, Chiefs find touch 5m out. 2ND HALF IS UNDERWAY! 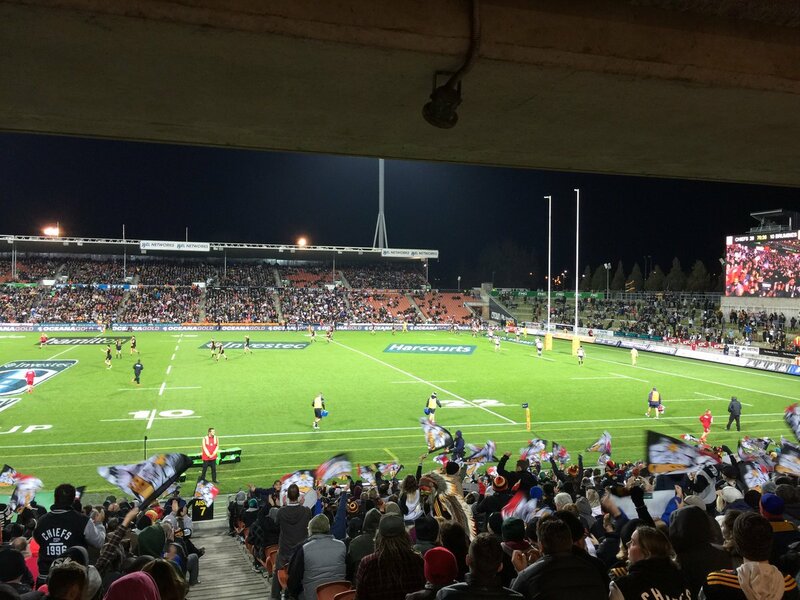 Aaron Cruden has kicked off for the Chiefs here at FMG Stadium. 40' | Hawera nails the penalty and that's halftime, Brumbies trail 13-10 at the break. 40' | PENALTY TO BRUMBIES | Chiefs penalised for a high shot, Brumbies elect for a shot at goal. 38' | Try is reversed for a forward pass, coming back to halfway for a Brumbies scrum. 37' | TRY TO CHIEFS | James Lowe scores in the corner after an interesting pass to put McKenzie in space...Chiefs extend the lead to 18-7. 36' | McKenzie kicks his second penalty, Chiefs extend the lead to 13-7. 35' | PENALTY TO CHIEFS | Brumbies penalised for offside, Chiefs elect for a shot at goal. 33' | Try is not awarded, 5 metre scrum to the Brumbies. 32' | PENALTY TO CHIEFS | Chiefs scrum wins a penalty, they take a quick tap! 30' | Great defence by the Brumbies! Scrambling tackle from Jackson-Hope saves a try. Lineout 5m out from their own line, Brumbies ball. 28' | PENALTY TO CHIEFS | Brumbies penalised for offside, Chiefs find touch inside the 22. 26' | Hawera adds the extras, lead is cut to 10-7. 25' | TRY TO BRUMBIES | Nigel Ah Wong busts through to score! 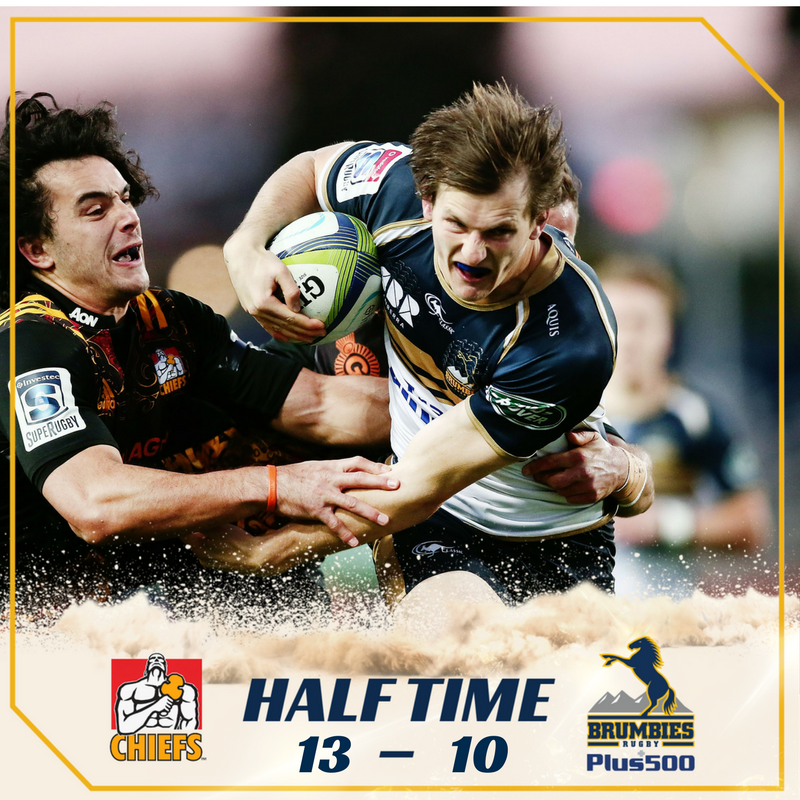 Brumbies cut the gap to 10-5. 24' | PENALTY TO BRUMBIES | Chiefs penalised for hands in the ruck, Hawera finds touch just outside the 22. 21' | Damian McKenzie nails the conversion, Chiefs lead is out to 10-0.